DeSean Jackson, All Pro wide receiver, for the Tampa Bay Buccaneers and his mother, Gayle Jackson, announced today that they have accepted an invitation, from Ire Carolina, Principal, Ernest E. Just Elementary, to partner with the Jacksons and their foundation in an effort to empower and motivate Just Elementary students. Gayle Jackson states that the timing is perfect. Last year, we were new to the Tampa Bay NFL franchise market. DeSean’s work schedule, the move and getting acclimated to a new team and City were first and foremost. This year, we wanted to re-brand and launch the DeSean Jackson Foundation in Tampa; and, it was important to DeSean that we go “off the grid” to develop a partnership with an elementary, middle and high school where he could be very engaged and impact the lives of those we serve. Just Elementary is good fit because Ernest E. Just was a pioneering African-American biologist, academic & science writer. Gayle wants to challenge the students to preserve Mr. Just’s legacy; and, hopefully, aspire to a career in research for a cure for Pancreatic Cancer. She also wants to encourage other NFL Moms, of Tampa Bay Buccaneers’ players, to join her in bringing Read Across America to Just Elementary. DeSean is looking forward to meeting with the young men and boys in the Just Gents Club and sharing his experiences and “Rites of Passage into Manhood’ as learned from his father, the streets of Crenshaw, the NFL and now as a father himself. The Omega Gent’s mentoring was established here at the Ernest E. Just Elementary in 2010. Omega Psi Fraternity, along with school personnel, have been mentoring about 35 students a year. This club’s program ideas are based on the vision of Stephen G. Peters, founder of the original gentlemen’s club, “Just Gents”, that was established here at Just Elementary in 2008. The ideals of the program are to reach and educate All of our children one child at a time. The Just Gents Club provides a vehicle to accomplish this goal. Our vision at Just Elementary is for students to become life-long learners and have a positive impact on their community. Just Elementary is located in West Tampa across from the North Boulevard Homes where students have been a product of generational poverty. Just is a Title I school with 98% of our students receiving free or reduced lunch. Although the community is undergoing redevelopment and our population has decreased, our student needs have not changed. We strive to provide them with as many opportunities as possible to prepare them academically and socially, but the support of outside organizations is imperative to help us meet our goals. My mantra is the Possibilities are Endless….Just Believe! Just would love the opportunity to partner with your son, DeSean, and the DeSean Jackson Foundation. Personally, I am a fan of DeSean’s and the Tampa Bay Buccaneers. It would truly be an honor for my students and school to be affiliated with your foundation. The Just Gents meet twice a month to learn character development concepts and discuss the value of true friendship. Role-playing and modeling techniques are used to create and enhance the individual self-esteem and a number of icebreakers and a scenarios are used to practice effective teamwork. The boys are in grades 3 to 5 and range from 8 to 11 years old. 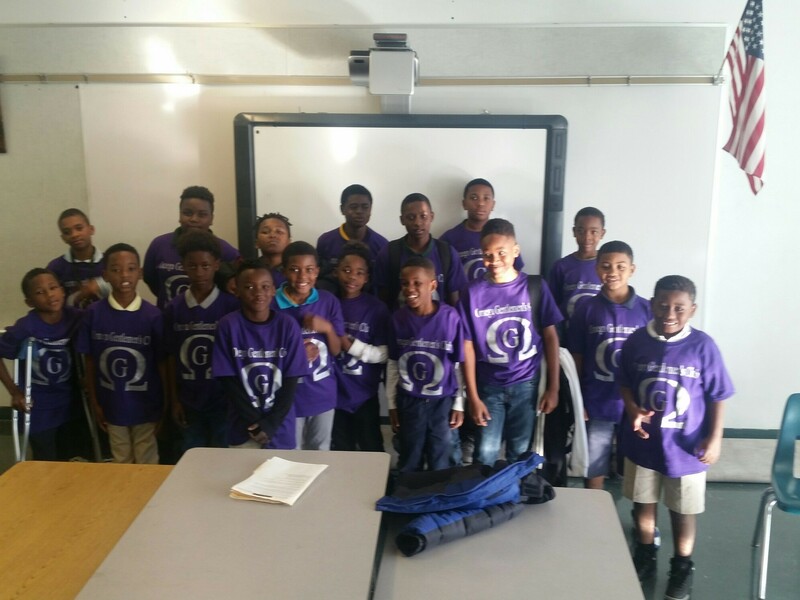 The Just Gents program is based upon the cardinal principles Rites of Passage Into Manhood, Scholarship, Perseverance and to Uplift the school’s name sake Ernest E. Just, who was a founding member of Omega Psi Phi Fraternity, Inc.
Members of the community are brought in to speak with the youth and encourage them to value themselves, families, friends and neighbors. Throughout the year, the youth learn new strategies to deal with the hardships of school and life as a young male growing up in today’s culture. At the end of the year the youth are engaged in challenges to complete task to exemplify what they have learned throughout the year. Upon completing the program the youth receive awards however the youth who complete the challenges are awarded enriched achievement awards such as bicycles, gift cards, etc. at the end of the year banquet. Ernest Everett Just (August 14, 1883 – October 27, 1941) was a pioneering African American biologist, academic and science writer. Just’s primary legacy is his recognition of the fundamental role of the cell surface in the development of organisms. In his work within marine biology, cytology and parthenogenesis, he advocated the study of whole cells under normal conditions, rather than simply breaking them apart in a laboratory setting. In addition to his scientific contributions, On November 17, 1911, Ernest E. Just assisted three Howard students in establishing Omega Psi Phi Fraternity, Inc. Originally a Junior High School that opened to relieve overcrowding at nearby Blake High School, Just had subsequently been used as a Head Start and 6th Grade Center, and then as an Early Childhood Center, serving preschool, Head Start, and Kindergarten children, until its closing in 2003. In 2003, construction began on a new Elementary School that would, for the first time in 30 years, provide services to the students from its community. On August 5, 2004, Ernest E. Just Elementary opened its doors to a student population that quickly rose to over 650 children. The staff at Just is striving to provide each and every student with an education and sense of self-worth that will carry them well beyond the education system. Carrying the torch in a legacy that began with our namesake is a challenge that enriches not only the students and staff of Ernest E. Just Elementary, but also the community and beyond. We’re close enough to the 2018 NFL season that we can start talking about records that could be broken in the normal course of the Bucs’ season ahead. DeSean Jackson has a chance to break one of Jerry Rice’s career NFL records. No, not the 197 career touchdown catches, not the 1,549 career catches, not the 22,895 career receiving yards — to be clear, nobody in history is within 40 touchdowns or 220 catches or 6,000 yards of those marks. Pretty amazing. The record in jeopardy? Most total touchdowns of at least 60 yards in a career. Jackson has 22; Rice has the record at 23, so with just two deep balls in 2018, Jackson has a cool (if obscure) place in the history books. Want to stump a friend? Ask who the next three on the list are. Maybe you get Devin Hester (21), but probably not Bobby Mitchell (20 from 1958-68) or Lance Alworth (19 from 1962-72). Jackson didn’t have any plays of 60-plus yards last season, just the second time in his nine NFL seasons that he went a full year without one, along with 2011. Jackson’s 60-yard touchdowns come from all over — 14 with the Eagles, eight with the Redskins; 17 on receptions, one on a rush and four on returns. He had six (!) in 2009. You can find video of most of the 22 here on the NFL’s site. Since 1994 (as far as pro-football-reference.com goes back for this), Jackson has the most 60-yard touchdown receptions with 17, more than Randy Moss (16), Terrell Owens (13) and Steve Smith (12). The only NFL player with 10-plus 60-yard TD runs in that span is Adrian Peterson, with 13. How embarrassingly close was Jackson to another 60-yard score? In 2011, he had a 61-yard touchdown catch that was reviewed and determined to be a 60-yard catch and fumble at the 1-yard line as he tossed the ball a split-second too early in celebration. The Eagles punched it in on the next play. On July 17, 2018, the stars came out for the $50K Charity Challenge Celebrity Basketball Game, presented by Monster Energy Outbreak. The event took over the Pauley Pavilion at UCLA the night before the ESPYs and included such talent as DeSean Jackson, All-Pro wide receiver for the Tampa Bay Buccaneers, Eric Dickerson, Simeon Rice, Terrell Owens, Rashad Jennings, Maria Menounos, Iggy Azalea, Blake Griffin, Floyd Mayweather, Tyga, Colton Underwood, Nick Viall, Kendra Wilkinson, Feli Fel, Lindsay Arnold, Rampage Jackson, Omarion, Saweetie, Kendra Wilkinson, James Kyson, Michael Blackson and more. The inaugural $50K Charity Challenge Celebrity Basketball Game hit the hardwood at UCLA’s Pauley Pavilion. Presented by the Monster Energy Outbreak Tour and Live Nation, this special event raised money and awareness for multiple charities in addition to the host beneficiary, Roger Daltrey and Pete Townshend’s WHO Cares initiative Teen Cancer America. Eric Dickerson’s team, sponsored by Boom Cups, defeated Andre Drummond’s team, which included DeSean Jackson who ‘balled out’, (playing for the Andre Drummond Philanthropic Fund), sponsored by Charity Bids, to win the $30,000 for the Floyd Mayweather Jr. Foundation. The final score was 71-64. Halftime featured musical performances by Tyga, Iggy Azalea and Saweetie, as well as a 3-Point and Free Throw Contest where celebrity participants played for the charity of their choice to win $5,000 for their charity. Jack McClinton (CEO of Active Dreamers) won the 3-Point Contest and there was a three-way tie between Lindsay Arnold (Dancing with the Stars), Colton Underwood (NFL/The Bachelorette) and Brittney Elena (MTV’s Wild N Out) for the Free Throw Contest. TAMPA — It starts below the sparkling diamond piercing his left ear: 1 of 1, Fear NONE! There might not be a better description of DeSean Jackson than the one tattooed on DeSean Jackson. At 5 feet 10 and 175 pounds, Jackson is pound for pound maybe the toughest player in the NFL. Now 30, he somehow has maintained his electrifying speed and was clocked as the second-fastest man in the league last season. His story is the kind they make movies about. In fact, they made a documentary of it. 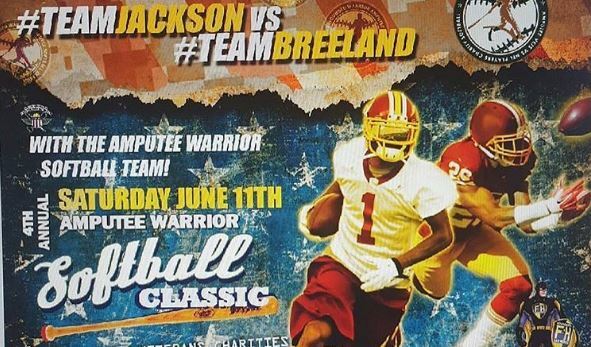 DeSean Jackson: The Making of a Father’s Dream. Jackson’s father, Bill, was a bus driver who moved his family from New Jersey to the Crenshaw neighborhood of Los Angeles. He drove his sons, Byron and DeSean, hard enough to become NFL players. Byron played receiver for two years on the Chiefs practice squad and is now a filmmaker. Bill was diagnosed with pancreatic cancer during DeSean’s rookie season as a second-round pick of the Eagles, which included a run to the NFC Championship Game. He died in 2009. Seven receivers were taken ahead of Jackson out of Cal, and only he and the Packers’ Jordy Nelson remain in the NFL. But Jackson was an instant star with the Eagles as a receiver and kick returner. He earned a reputation for preening and adding much flash to go with his dash. Twice he dropped the ball at the 1-yard line in a premature touchdown but there’s no denying his greatness. Jackson’s career average is 17.7 yards per reception. He’s two catches shy of 500 and has 8,819 receiving yards and 46 touchdowns. But his six seasons with the Eagles came to an abrupt end when the team released Jackson, reportedly for his work ethic and attitude but also for his alleged ties to Los Angeles street gang members. Jackson rebuilt his career in three seasons with Washington before signing a three-year, $33.5 million contract with the Bucs with $20 million guaranteed. Jackson is an engaging entrepreneur off the field, who owns a record company, a marketing company and was the co-producer of All Eyez on Me, a biopic on rapper Tupac Shakur. He’s father to his nearly 2-year-old son, DeSean Jr. He’s bright, driven, fast, rich, likeable, little and afraid of nothing. We caught up with DeSean at his new 5,000-square-foot home in North Tampa for a reflective interview with the Bucs’ new star. It’s great, man. It’s taught me a lot more patience to be mellow, and really it’s just all about teaching. Being in the mode of wanting him to do all the right things and grow up and be raised the right way. You take a step back, because you know, just kind of think how I want him to do things. So much of your story is about A Father’s Dream. Do you have a father’s dream for your son? The only thing different would be I don’t want him to play football. I want him to play like baseball or basketball probably, where they’re getting all that crazy guaranteed money. I mean if he comes to me saying he wants to do it, obviously, I’m going to let him do it. But I think my dreams would be a little different. Everything my dad taught me growing up, the characteristics, the hard work, being able to get up and go get it, I still have the same mentality with my son that my dad had for me. Did you imagine you would be entering your 10th year in the NFL? Honestly, it’s a blessing. You get all the young guys coming in, the freak of natures, big guys, little fast guys, and it continues year in and year out. So to be going into my 10th year and be playing in Tampa Bay — I couldn’t have predicted that. Like I say, it’s a blessing. I count my blessings and continue to work hard. It’s a new year, so I’m excited about it. I don’t know if I could’ve predicted that story way back then when I was younger. I don’t know. But I’m definitely happy still to be able to play in the NFL at a high level. This is a new start, your third team, what about being in Tampa Bay excites you? I think even before I started, going back to last season with the Redskins, we were trying to make a push into the playoffs last year. Us and Tampa were going back and forth. We would play a game, just finish a game, and we’d be looking over seeing what they were doing on SportsCenter. They had an intriguing team. I think last year they started some great things here with the way their defense played. They had a physical defense, with the linebackers they’ve got and the D-line. There’s a lot of upside to this team, so I was able to keep my eye on them last year going into free agency and the offseason. Did you have any interaction with Winston before signing with the Bucs? Not really. It was kind of phone calls when he reached out. We just had a good relationship. He showed me early on respect by telling me, “Man, I’d love to have a fast receiver like you. I’ve never played with a guy like that.” So just to have that relationship, being friends and competitors in the NFL, respecting each other, it was one of those “I would love to play with you.” There were never any in-depth conversations, just “Man, if we played together, it would be scary.” And look how it plays out. How are you going to like living here? I’m a California guy, so this is close to it. It’s just a little different because of the humidity, the gators and all that kind of stuff. There’s a lot of water. I like fishing and playing with the boys in the pool. I just enjoy the sunlight. My time in Philly and my time in Washington, when winter comes it’s snowing and it’s raining. You can’t do nothing. So now we don’t have to worry about the snow. Now we’ve got an extra five or six months being out in the sun and staying hot. I’ll take advantage of it when I can. You’ve become a real entrepreneur off the field with several businesses. You were the co-producer of All EyeZ on Me. What was that like? The success of the movie has been great. This is my first official big movie. I’m the co-producer, invested in the movie, so the movie did great, and I was very happy about that, especially with my first movie. I don’t know, just being so far along in my career, you never know when ball is going to blow up and you’re sitting back and doing some other things. I felt like I didn’t wait too long to figure out what I was going to do as far as interaction with kids, movies. I have a marketing company, a record company. I’m doing music. I just really want to help these young kids, just give them a life and give back. You know, I have much information, so much stuff I’ve been through. I mean, I would be stingy and greedy to keep it all to myself. Are you doing this with help from your friends? Yeah, pretty much. I say it’s worldwide because I don’t want to be stuck in one area. But definitely back in California. We’re doing some things in Atlanta. I want to do everything I can while I’m done here in Tampa, so I’ve met Derrick Brooks and Gary Sheffield, guys like that. Just trying to stay influenced the best that I can and work hard. For a guy like me going into the offseason, this is my 10th year, so it’s not so hard as it was when I first came into the league and thought I had to grind, grind, grind. I still work hard, don’t get me wrong, but at this point, I know what to do. I know what I have to do to get my body ready. It gives me a lot more time outside of football. Is that something you had to learn to manage, off-the-field interests and training? I’m training like I’m getting ready for the 100 (meter) race in the Olympics. But I mean, that’s what I love to do. One thing about track, people need to realize track workouts are very hard. There’s nothing compared to it. You have to run like 300s, 350s, 150s. In football, you’re just sprinting up and down the field. It’s nothing like that. I think this gets my endurance going so I’m able to play throughout the whole season. You got back to more track workouts, didn’t you? Yeah, I actually got back with Coach (Gary) Cablayan. I got to the point where I was feeling myself. My physical conditioning was good, but I stopped training with him, so this year I got back to the roots, back to the basics. I’m in the best shape ever right now. Obviously, there’s the heat and the humidity, but I feel good. They clocked you as the second-fastest player in the NFL last season. To accomplish that at this point in your career, does it go back to all your training with your father? It’s a testament to just the mentality and the hard work that was instilled at a young age. The people that have been with me, staying on me, staying in my ear. It was always motivating. And not only just motivating, I wanted to get the most out of it. A lot of people nowadays have success and they kind of forget where they came from or forget the steps it took them to get where they’re at. You got to take a step back and say, “I don’t just want to be here, I want to be great.’ You got to go put some extra work in and get out of your comfort zone and put yourself in more uncomfortable situations to get more out of it. What do you remember about your time in Philly and how do you feel about the way it ended? I think about an awesome team. I think about awesome players that if we had stuck together, the sky was the limit. There’s no telling what would’ve happened. (Donovan) McNabb, Brian Dawkins, Mike Vick, LeSean McCoy, Asante Samuel, Jeremy Maclin, me — I can go on and on about the players and talent we had there. When I think about those days, I think about the camaraderie we built, the kind of savviness we had playing together. The Philadelphia Eagles were known as a winning team back then. It was unfortunate it had to get broken up the way it did. But that kind of set the bar early in my career to know what it takes to consistently win, the mentality, the swagger, the demeanor, just the nastiness. You’ve got to have it all to play in this game and play at a high level. Throughout the way, that showed me I always had to keep my level of play at a high level. You can never slack off, not one player or two players on the team, because football is a team sport. If you have that tight bond and refuse to go down, it was just something I learned. To come in and do that, I think we did a good job when Jay Gruden was in there (as coach). In the NFL, what you want is camaraderie and everybody being able to feed off the energy. That’s what it takes to go far. You look at the New England Patriots. You look at the Denver Broncos. Teams that have won Super Bowls. All those teams have a niche. They have one or two players that set the tone out there, the Richard Shermans or the Von Millers. If you don’t have that savviness, you’re not going to have a winning team. Sometimes you need guys that have some controversy. You need guys to go out and do the ordinary stuff. It’s something I’ve been able to learn and being 30 now, hopefully, I will be able to bring some savviness this year to Tampa. Did it hurt you that after you left there were accusations that you had gang affiliations? Because everybody doesn’t know how to take it. Everybody wasn’t raised the way I was raised or had to go through what I had to go through. I just took a step back. I was frustrated about it, but I’m never ashamed to represent or show where I came from. There’s a lot of people that don’t make it out to see it, so I try to shed a light on it and bring the people I grew up with me. Not only that, go back to the area and hang with them and try to show I’m not too big to keep enlightening them and know it’s possible to make a life. “If I came from the same area and I made it, it’s possible you guys could. Maybe not in football, maybe in something else. But it’s possible to make it.” That was my whole journey. When I did become a professional athlete, and what I was doing in the offseason, hanging out in areas I grew up in. I didn’t feel that was wrong to go hang out with people and do things you did growing up. I not once was a felon, not once was in jail. They just made this perception out to be that I was some crazy guy. But did you learn that perception can hurt your brand? It’s a violent game and you’re not the biggest guy, but you run all the routes. What’s your mentality on Sundays? I think it goes back to how I was raised and having that no-fear mentality. Seeing the things I saw on a daily basis and never being content. Knowing that if I had an opportunity to make it, I was going to make the most of it once I got there. I wasn’t going to be satisfied just because I made it. I felt if I get there and I make it, after all the doubt and all the hate, then that gives you another fire. After being projected to be a first-rounder and slipping into the second round, there’s just all types of stuff that builds up. So now I’m on the field playing against all the teams that passed on me, all the critics and naysayers that said I couldn’t do it. I bottle all that up into, I don’t know whether you want to say fire or energy, whatever you can use it for, you use it. It’s just proving people wrong. You’re proving you can go against all the naysayers. You’re proving you can do it under 6 feet. You’re proving you can play like a Randy Moss or you can play like a Chad Johnson. I just go out and try to do me. I don’t mimic or mock anyone else. Go out and be DeSean Jackson day in and day out and come to work with the same attitude and don’t accept no for an answer. They said you couldn’t do this. Prove to them you can do it. That’s the mentality I have every time I have an opportunity to go out on the field and beat a defender or score a touchdown and beat the odds, that’s what I’m doing, going out there to beat the odds. They say even a player like Tom Brady still taps into the fact he was a sixth-round pick for motivation. Do you draw from your background to play this game? I think it’s the common denominator. I knew how good I was. My family knew how good I was. My dad knew how good I was. It just was on me to go out there and prove it. It was on me to show the world what DeSean Jackson could do. I’d say year in and year out, day in and day out, it’s a task. It’s a job. It’s something I’m dedicated to. Are you going to be dedicated to being great? Are you dedicated to being good? Are you dedicated to just being average? That’s what so funny about it, this world will give you as much as you’re willing to take. When I say take, I mean put in the hard work to do it. You’re not going to get there, you’re not going to do it sitting on this couch and eating popcorn. You’re going to have to get in that gym. You’re going to have to be uncomfortable. You’re going to have to do things your body doesn’t want to have to do. But you got to go do it. That’s the edge you have to keep. Being 30, there are guys coming into the league that are 21, 22. I mean, c’mon, they’re freaks of nature. I have to prove I still am the guy. When my time is up, it’s knowing it’s up. It’s not being naive and saying, “I can still do it.” If you can’t do the job, let the next man up. I’m a firm believer that I still have like five years left. There’s a lot of expectations for the Bucs this year. What do you expect? I’m just having fun with it, man. Hopefully we can put together a special year. I think this year will be definitely special. There’s a lot of attention. A lot of expectations. And you know, I remember being in Philly, we had the dream team. That year, I think (backup quarterback) Vince Young put something out there about, “Yeah, we got the dream team.” It was kind of funny because that year, we didn’t do as good. Sometimes you put too much attention on yourself, and it’s good to have attention, but sometimes you want to be under the radar a little bit. It’s good because you can have attention and still be mellow. We’re not the favorites. But sometimes people can make more out of the attention. sp_I think Dirk (Koetter) has done a good job of letting people know we haven’t done anything yet. We haven’t won any games yet. How much is playing in the Super Bowl a driving force for you? For sure, it’s always been the goal since day one. Obviously, everybody plays for personal goals and stats, but the ultimate goal is the win the Super Bowl. Year in and year out, every team I’ve been on, that’s been the goal. Get through the season with a good enough record to get into the tournament and once you get there, everyone is 0-0. It’s man against man. Four games to get there. I can remember my first year (in the NFL) like it was yesterday. We were one game from the Super Bowl. It’s crazy because I scored the last touchdown that I thought was going to be the touchdown to put us in the Super Bowl and then Larry Fitzgerald comes down and scores a touchdown and we lose. That was like one of the best games I’ve ever been a part of. LOS ANGELES, Calif. (May 17, 2017) –The star-studded 4th Annual Single Mom’s Awards took place at The Peninsula Beverly Hills on May 11. Presented by Single Moms Planet, a Los Angeles-based non-profit organization created to assist struggling single mothers, the Single Moms Awards honors notable individuals who inspire, provide an example or give support to single mothers through their work, philanthropy or volunteerism. Actress Garcelle Beauvais was honored as Entertainer of the Year; Kelly Vlahakis-Hanks, Earth Friendly Products CEO, was honored as Business Innovator of the Year; Baby Ecos was honored as the Family Brand of the Year; Gayle Jackson, Co-Founder, and CEO of The DeSean Jackson Foundation, was honored as Sports Mom of the Year; Joanna McFarland, Carolyn Yashari-Becher and Janelle McGlothlin, founders of Hop Skip Drive, were honored as Corporation of the Year; Christy Salcido, Senior Vice President of Ketchum Inc., was honored as Visionary of the Year; Jan Perry, General Manager of the Los Angeles Economic & Workforce Development, was honored as Leader of the Year; and Karla Keene, CEO of Clarity RX, was honored as Entrepreneur of the Year. Single Moms Planet was founded by event producer and television host, Neferteri Plessy to bring much-needed programs to under-resourced single mother households. The event, held at The Peninsula Beverly Hills, was hosted by NBC 4 Los Angeles reporter Beverly White and author/TV personality Rosie Rivera, sister to late banda singer Jennie Rivera. Among the guests were NFL stars DeSean Jackson, Rodger Saffold, Jamon Brown and Todd Gurley, as well as actors Daphne Wayans, Carrie Stevens, Christy Buss, Alyssa Reeves and many others. This year’s presenters included Los Angeles Rams running back Todd Gurley; Actor, Tom Williamson (“The Fosters”); TV Producer, Kerri Zane; Entrepreneur, Anastasia Soare, founder of Anastasia of Beverly Hills; CEO of The Balanced Mom, Asia Saffold; and noted fashion bloggers Heidi Nazarudin and Rachel Pitzel. We are proud to announce that we are honoring Gayle Jackson with the 2017 Sports Mom of the Year Award. 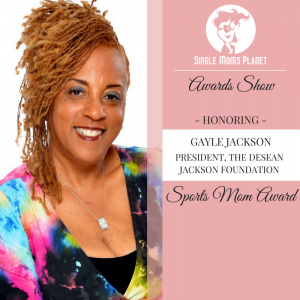 Gayle is the Co-Founder and President of the DeSean Jackson Foundation, founded in 2009 to raise Pancreatic Cancer awareness, after her husband, Bill, died from Pancreatic Cancer while her son, DeSean Jackson, was a rookie with the Philadelphia Eagles. The mission of the foundation is: To advance the common good by caring, cultivating, collaborating and advocating–One Team, One Purpose. To date, DJF is one of many business ventures developed by DeSean and Gayle Jackson; but, the only non-profit entity in their diverse portfolio of interests and holdings. Gayle takes a considerable amount time and effort to keep DJF a separate, distinct brand with no encumbrances from DeSean’s personal or professional interests. DJF is a public charity that has been incorporated in each NFL city where DeSean plays with the intent and purpose to improve the quality of life for those in need, acceptance, sensitivity and tolerance through their unique brand and DeSean’s status in the NFL; and, the Jackson family is truly hands on. This requires a complex strategy of re-branding from the NFL franchise markets of the Philadelphia Eagles, Washington Redskins, Tampa Bay Buccaneers; and, as always their home base in Los Angeles, CA. Gayle also oversees all of DeSean’s professional and personal endeavors, brand and image as his mother, manager and business partner. In 2013, the Jacksons were successful in bringing the documentary The Bill Jackson Project: The Making of a Father’s Dream to fruition. It was the result of 18 years of Byron Jackson documenting every aspect of the making of his NFL All Pro brother, wide receiver, DeSean Jackson, from Pop Warner to the NFL Pro Bowl; and, the rocky journey of a family to stay together through it all, despite their differences and in the face of mounting pressure; and Bill Jackson’s battle with Pancreatic Cancer. The documentary was distributed by several major cable outlets, Wal-Mart, Amazon, Target and was selected for viewing at the prestigious San Francisco Black Film Festival XL, June 13th – 16th, 2013. 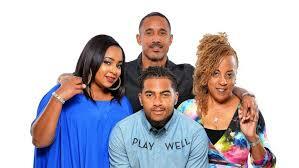 In 2015, BET debuted the unscripted, reality show, DeSean Jackson: Home Team, which one again profiled the Jackson family living the atypical everyday lives of a NFL family who’s matriarch is a single, phenomenal woman who leads a team of female associates who manage the personal and professional affairs of a high-profile professional athlete. Gayle received numerous accolades for her honest depiction of the obstacles, pitfalls, uncertainty and truth about the reality of being an NFL family; and, especially being a mother of a NFL player—her strength, resolve and brutal honesty. The reality show was filmed during NFL off-season and aired for one cycle on BET. On June 16, 2017, the long-awaited Tupac Shakur biopic, All Eyez on Me, (another Jackson business venture) will be released. DeSean, is an investor, movie producer and has a cameo role. Gayle states this is part of God’s plan for transitioning her son for life after football with her blessing and support. Evidence of the values and virtue instilled in DeSean by his mother. Gayle is a graduate of Duquesne University, Pittsburgh, PA, former probation officer for Allegheny County, Pennsylvania, and was formerly employed at Warner Bros and Capitol Records, Los Angeles, CA in the legal, marketing & artist development (domestic & international) departments; Ron Sweeney, Esq. who managed Kylmaxx, Alexander O’Neal, Cherrell, The Time, BabyFace and others; and, Patrick Raines & Associates who managed Al Jarreau and other artists. Gayle has been profiled numerous times during DeSean’s tenure in the NFL in regards to her work as a former board member, of the Professional Players’ Mothers Association (PFPMA); NFL Mom’s Read Across American Program, the Pancreatic Cancer “Purple Out” and as her son’s liaison with the NFL, NFLPA, Philadelphia Eagles and Washington Redskins. She was also profiled in Ebony magazine in its special Mothers’ Day edition that highlighted prominent NFL players and their mothers; and, was one of the recipients of the 2015 Beauty In/Beauty Out (BIBO), Los Angeles, phenomenal women awards.